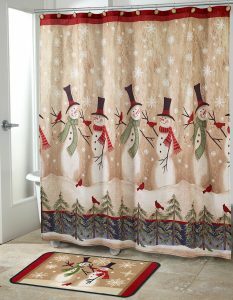 A very easy way to bring the spirit of the season to the bathroom is by changing out the linens, rug, and shower curtain. Choose holiday prints and patterns for hand towels and bath towels. There are many design options to select from for shower curtains, as well. You could also keep it simple by choosing a color scheme like red and green or red and white. Select decorations to place on top of the toilet and the counters that are easy to clean. For busy bathrooms that get a lot of use, it’s important to be able to keep them clean, especially if you’re hosting guests. Use that as a guide to choosing decor items. Decorations with smooth ceramic surfaces can be wiped down and dusted quickly, which is a must in a bathroom. Avoid items with a lot of glitter, or items made out of fabric. Don’t clutter the counters with items, but do add some charm to a few select holiday pieces. Add a candle or an air freshener with a sweet holiday scent such as a spruce tree or warm vanilla sugar. It will bring that extra touch to the bathroom, where an air freshener is always needed. A lit candle on your countertop can be the perfect accent in this space when hosting family and friends for holiday gatherings. When dressing up your home for the holidays, take the time to select decor for the bathroom. It’s a small space, but can easily add to the holiday charm.